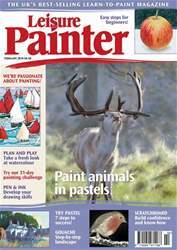 Do you have painter’s block or simply need an injection of inspiration? Draw or paint every day throughout January for anything between six seconds to 60 minutes and watch your skillset take off. Painting small and often over short bursts of time is guaranteed to make you more creative and productive so why not kick things off this January with the following tasks? DAY 1 Get out and about. Visit public places; coffee shops are my favourite. Make pure and modified contour drawings in a small sketchbook that won’t draw attention to you. These can take seconds or minutes. Do as many as you can in an hour. DAY 2 Make the unfamiliar familiar. Paint objects from the bathroom cabinet, the garden shed or that forgotten cupboard; you don’t always have to paint what’s pretty. This exercise is dependent on you experimenting with interesting light, format and compositions. DAY 3 Cool and warm. Explore colour temperature with burnt umber, ultramarine blue and white. Lean towards brown for the warms and blue for the cools. Snow scenes are a good place to start.